An Air Canada DC-9 similar to the aircraft involved in the accident. Air Canada Flight 797 was an international passenger flight operating from Dallas/Fort Worth International Airport to Montréal–Dorval International Airport, with an intermediate stop at Toronto Pearson International Airport. 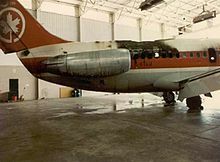 On June 2, 1983, the McDonnell Douglas DC-9-32 operating the service developed an in-flight fire behind the lavatory that spread between the outer skin and the inner decor panels, filling the plane with toxic smoke. 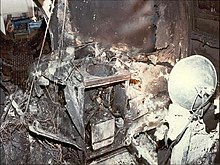 The spreading fire also burned through crucial electrical cables that disabled most of the instrumentation in the cockpit, forcing the plane to divert to Cincinnati/Northern Kentucky International Airport. Ninety seconds after the plane landed and the doors were opened, the heat of the fire and fresh oxygen from the open exit doors created flashover conditions, and the plane's interior immediately became engulfed in flames, killing 23 passengers who had yet to evacuate the aircraft. The accident became a watershed for global aviation regulations, which were changed in the aftermath of the accident to make aircraft safer. New requirements to install smoke detectors in lavatories, strip lights marking paths to exit doors, and increased firefighting training and equipment for crew became standard across the industry, while regulations regarding evacuation were also updated. Since the accident, it has become mandatory for aircraft manufacturers to prove their aircraft could be evacuated within 90 seconds of the commencement of an evacuation, and passengers seated in overwing exits are now instructed to assist in an emergency situation. Just after Ouimet returned to the cockpit, the cockpit "master warning" light lit up, warning the pilots of a loss of emergency electrical power. Cameron ordered Ouimet to switch to battery power, but the loss of main and emergency electrical power caused some electrical systems to fail, including power for the vertical stabilizer. This caused the stabilizer to be stuck in the cruising position. :4 This made controlling the plane's descent extremely difficult and required great physical exertion from the pilot and first officer. Smoke filled the passenger cabin and entered the cockpit as the plane descended. :7 The PA system also failed, leaving the flight attendants unable to communicate efficiently with the passengers. Nevertheless, attendants were able to move all passengers forward of row 13, and to instruct passengers sitting in exit rows on how to open the doors,:8 a practice that was not standard on commercial airline flights at the time. Fire damage in the aft lavatory, the point of origin of the fire. At 19:20, Cameron and Ouimet made an extremely difficult landing at Cincinnati/Northern Kentucky International Airport. Four tires blew out during the landing. Once the plane came to a stop, Chief Flight Attendant Sergio Benneti was the first to open the front door of the aircraft, and escaped out that way. The pilots quickly shut the airplane down. The overwing and forward aircraft doors were opened, and slides at the front doors were deployed. 18 passengers and all three flight attendants were able to evacuate using these exits. :8 Opening the doors also caused an influx of air that fuelled the fire. The pilots were unable to go back into the passenger cabin due to the smoke and heat. :8 Ouimet escaped through the co-pilot's emergency window shortly after the plane landed, but Cameron, who was exhausted from trying to keep the plane under control, was unable to move. Firefighters doused Cameron in firefighting foam through Ouimet's window, shocking him back to consciousness; Cameron was then able to open the pilot's emergency escape window and drop to the ground, where he was dragged to safety by Ouimet. Cameron was the last person to make it out of the plane alive. Less than 90 seconds after touchdown, the interior of the plane flashed over and ignited, killing the remaining 23 passengers on board. The passengers trapped inside the plane died from smoke inhalation and burns from the flash fire. Of the 18 surviving passengers, three received serious injuries, 13 received minor injuries, and two were uninjured. None of the five crew members sustained any injuries. :8 Dianne Fadley, a survivor, remarked: "it was almost like anybody who got out had nothing wrong... You made it and you were completely fine, or you didn't make it." The fire completely destroyed the aircraft. It was noted the infinite oxygen supply fueled the hungry fire, and it ignited with the force of an explosion. Twenty-one Canadians and two Americans died. Many of the victims' bodies were burned beyond recognition. Almost all of the victims were in the forward half of the aircraft between the wings and the cockpit. Some victims were found in the aisle, while others were still in their seats. Two victims were in the back of the aircraft, even though the passengers were moved forward after the fire had been detected; the disoriented passengers moved beyond the overwing exits and succumbed. Blood samples from the bodies revealed high levels of cyanide, fluoride, and carbon monoxide, chemicals produced by the burning plane. Fire damage in the front section of the aircraft. Fire damage in the rear of the aircraft around the aft lavatory. Because the accident occurred in the United States, it was investigated by the National Transportation Safety Board (NTSB). This particular DC-9 had experienced a number of problems over the months leading up to the incident; 76 maintenance reports had been filed in the plane's logs in the previous year, and the CVR records Cameron telling Ouimet to "put [the tripping breakers] in the book there" when the breakers fail to respond to the first reset attempt at 18:52. Cameron attempted once more to reset the breakers at 18:59. The CVR records arcing sounds followed by the popping sound of the breakers continuing to trip again after each reset over the next 60 seconds. 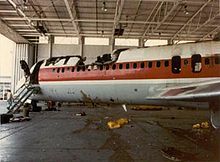 Nearly four years earlier, on September 17, 1979, the plane, then serving as Air Canada Flight 680 (Boston, Massachusetts, to Yarmouth, Nova Scotia), had suffered an explosive decompression in the rear bulkhead that required rebuilding the tail section and replacing or splicing most of the wiring and hydraulic lines in the back of the plane; Cameron later noted that the Air Canada maintenance crew "did a heck of a job getting everything put back together" after the decompression incident. Investigators were unable to find signs of arcing in any of the wire splices from the repairs done four years earlier, though much of the wiring in the rear of the plane was severely damaged or destroyed by the fire itself. Newspapers and other media criticized the actions taken by the crew and said that the pilots took too long to initiate an emergency descent. The NTSB report was especially critical of Cameron for not asking about the exact nature of the fire and not immediately initiating emergency descent when the fire was first reported. Cameron admitted in a press conference following the issuance of the NTSB report that he assumed the problem was a garbage bin fire, a common cause of lavatory fires when smoking was still allowed on flights. "All I know was that I did the best I could," Cameron later said. "I'm very sorry the people that didn't get off, didn't get off, because we spent a lot of time and effort getting them there." After the NTSB issued its report, a number of commercial pilots and airline personnel petitioned the NTSB to revise its report. In addition, first officer Ouimet sent the NTSB a detailed defense of the crew's actions, including the decision to land in Cincinnati instead of Standiford Field Airport in Louisville, Kentucky, the airport closest to Flight 797 when the crew first declared an emergency. Ouimet stated that Louisville was too close to be able to descend from cruising altitude to an emergency landing safely, and even landing in Cincinnati was a questionable proposition given Cameron's difficulties in controlling the plane. The crew of Flight 797 were later honored by multiple Canadian aviation organizations for their heroic actions in landing the plane safely. Cameron died from complications of Parkinson's Disease on December 3, 2016 in Ottawa, aged 84. Strong suggestion that passenger instruction in how to open emergency exits become standard practice within the airline industry. Hand-held fire extinguishers using advanced technology extinguishing agents such as Halon. George Curtis Mathes Jr., 54, head of a corporation that made premium television sets that bear his namesake "Curtis Mathes." He had moved to Toronto a few years earlier, but kept his company in the Dallas area. He was killed in the fire. Stan Rogers, Canadian folk singer, aged 33, was one of the deceased on the flight. Rogers is known for songs such as "Northwest Passage", "The Mary Ellen Carter" and "Barrett's Privateers". He was going home on Flight 797 after attending the Kerrville Folk Festival in Texas. He died in the fire of smoke inhalation. After this incident, Air Canada sold the right wing of this DC-9 aircraft to Ozark Air Lines to repair a damaged airplane. On December 20, 1983 Ozark Air Lines Flight 650, served by a DC-9 with tail number N994Z, had hit a snow plow in Sioux Falls, killing the snow plow operator and separating the right wing from the aircraft. A wing from C-FTLU was used to replace the one separated on N994Z after the incident. The aircraft was later sold to Republic Airlines, and acquired by Northwest Airlines after Republic merged with Northwest. As of 2012[update], N994Z was sold for scrap to Evergreen after being assigned to Delta Air Lines, which now owns Northwest Airlines. The Discovery Channel Canada / National Geographic TV series Mayday (also called Air Crash Investigation, Air Emergency, and Air Disasters (Smithsonian Channel)) featured the accident in a 2007 episode titled Fire Fight which included interviews with survivors and accident investigators and a dramatic recreation of the flight. ^ a b c d e f g h i j k l m n o p q r s t u v w x y z aa ab ac Aircraft Accident Report: Air Canada Flight 797, McDonnell Douglas DC-9-32, C-FTLU, Greater Cincinnati International Airport, Covington, Kentucky, June 2, 1983 (Supersedes NTSB/AAR-84/09) (PDF). National Transportation Safety Board. NTSB/AAR-86/02. Archived from the original (PDF) on August 19, 2007. ^ a b c d e f g h i j k l m n o p q r s t u "Fire Fight". Mayday. Season 4. 2007. Discovery Channel Canada / National Geographic Channel. ^ "Canadian Civil Aircraft Register (C-FTLU)". Transport Canada. ^ a b "CVR transcript Air Canada Flight 797 – 02 JUN 1983". Aviation-Safety.net. October 16, 2004. Retrieved October 29, 2010. ^ Aircraft Accident Report: Air Canada Flight 797, McDonnell Douglas DC-9-32, C-FTLU, Greater Cincinnati International Airport, Covington, Kentucky, June 2, 1983 (PDF). National Transportation Safety Board. August 8, 1984. ^ Lobsenz, George (July 10, 1984). "Air Canada crew criticized in fatal flight". UPI. Retrieved May 31, 2018. The Air Canada captain and co-pilot were honored by their peers last year when the received the ALPA superior airmanship award for bringing their stricken aircraft to a landing. ^ "Artist: Rogers, Stan." Canadian Online Explorer. Retrieved on March 1, 2009. ^ "FAA Registry (N994Z)". Federal Aviation Administration. ^ "National Transportation Safety Board Aircraft Accident/Incident Summary Reports" (PDF). National Transportation Safety Board. September 30, 1985. pp. 17–19. Retrieved October 29, 2010. ^ "FAA Registry – Aircraft – N-number Search Results". FAA.gov. Retrieved October 29, 2010.